Welcome back to Tribal Apocalypse, the PRE where memory is served. Both Christmas and the end of the year are coming, so I wanted to do a little Ghost of Christmas Past preamble today, going back to the old, old times when Magic was just a newborn baby and the tribal concept wasn't even conceived (or conceivable). I'm talking about the moment of singularity that sparked the creation of this whole universe: the Alpha set, and what I like to call the Original Tribes. Which creature types (mostly retroactively assigned by our godfather Mark Gottlieb years later, during the the Grand Creature Type Update of 2007) were already there in the summer of 1993? Which are the ancestral precursors of the 203 creature types (tokens excluded) we see printed on cards today? So, these are the 64 Original Tribes. Fascinating, isn't it? There's quite a few oddities in there. Some of these tribes would almost disappear (Cockatrice wasn't to be used ever again, mainly because it's impossible to do, being a type define by the one mythological monster). Other were blown out of proportion (Wall already had 10% of the total number of members going to ever be printed: of course, once the Defender ability was introduced, they decided it didn't need to be on Walls only).There were only 2 Elves, the same number as Orcs and Dwarves, both of which didn't have the same bright future ahead of them (soon, someone in the creative department would essentially rule them out, possibly to differentiate Magic from a classic Middle Earth fantasy setting). How do we miss them... not. But what's even curiouser are the unique members: Obsianus Golem was the original Golem; Prodigal Sorcerer was the original Wizard; Scryb Sprites was the original Faerie (in green! ); and of course, Sengir Vampire was the original Vampire, and Giant Spider was already there as the original Spider. Some of these tribes would become more interesting along the road. Others would get some much-needed fashion advice. What to do with all of this? Well, a more detailed article possibly, as I always love these kinds of trips down the memory lane. But maybe also a theme week next year. Wouldn't that be cool? A week devoted to the very roots of the tribal side of the game, with only the Original Tribes allowed (maybe excluding too obvious Elf, Goblin, and Human), to see how far they went from there in these (gulp!) nearly 20 years. Maybe with a special prize for using the very Original Members in the decks. Not a lot of those are still played these days. I believe the longest success histories are Birds of Paradise, Llanowar Elves, and Lord of Atlantis. Unless you count the 19-year tenure of Giant Spider as "Again With That Stupid Thing!" as a success. But enough with the (distant) past. Let's talk about the (recent) past. A little classic stuff, a little novel stuff. And a little returning stuff. Congrats to old glory gbagyt for coming back to 1st place (and to the tournament) after 90 weeks! Last time in the long, long forgotten Event 12 was with Knight. This time with this Human build that brings our real-life counterpart tribe to the record 9 wins, leaving Elves (8 wins) and both Goblins and Walls (7 wins each) behind. I should find a name to these four, uber-successfull tribes. The Usual Suspects? The Hatetastic Four? Love the Commander feeling of all those 1-of and legendary guys. 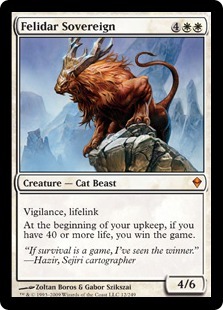 With this lifegain-heavy build, gbagyt also got the Felidar Sovereign achievement (while specialist Chamale brought back his 250-card monstrosity to finally unlock the Battle of Wits one, plus the Helvault one while at it). A few interesting choices here: Goblin Fireslinger over Goblin Guide seems bizarre, but Ember Hauler is solid, as is the pauper-inspired Mogg Flunkies. 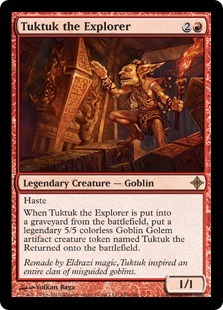 And you gotta love the unexplored (pun intended) interaction between Goblin Grenade and a forgotten card like Tuktuk the Explorer. Even when oh so slightly moved to almost-midrange, aggro Goblins still rock (morpphling even managed to go one step up of his original placement after the playoff round). Also, they make for unbelievable cheap builds. And when I say "unbelievable", I really mean it. Check the price for this deck, then don a hat, then tip it to Senhor Morpphling. A break from tradition comes at 3rd place: newcomer Jerkburton77 (a warm welcome to you, sir!) using Ninja, at their very first Top 4 result (yet undefeated, which earns them the Up-and-Coming Prize nonetheless) during the course of their 7 appearances within the Blippian Era. We see one of the recent, strong Planechase 2012 addition here in Silent-Blade Oni (surprisingly, no Sakashima's Student. Budget issues? The deck is strongly budget-friendly, a couple Students would cost more than the whole list). 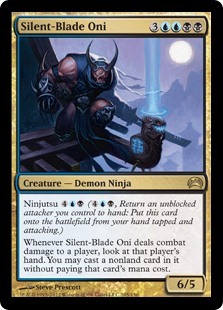 And great flavor with both the support cards, Artful Dodge and Sai of the Shinobi. 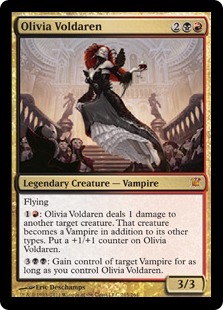 A definitely strong deck that still doesn't lose track of a more Vorthos-like sensibility. Good job, sir. Fourth place, another newcomer (we had plenty this week: a salute to jimbilly517 too, coming 5h place with Human): fellow West-European (he's French) Dolane97 with Vampires. Solid Rakdos build with a good balance between early pressure and mid-game options. We'll have the chance to see it in action in a bit (see below). And here's the very close, decisive game of the match I lost to Dolane97 and his Vampires, despite the Pod having an active role (or trying to). My chances for a Top 4 placement evaporated after that anti-climatic endgame. Good games overall, though. As for our resident tribal guru AJ_Impy, this week he felt like building a Construct deck then piloted it to a 2-1 score (along with me and jimbilly517, as already mentioned, plus _BIG_BROTHERS_ with Elf, romellos with Kithkin, bdgp009 with Goblin, and ellmaris with Vampire). combo win". And the win is game 3 against current all-time #1 player mihahitlor, who was piloting a Human build (without much success this time). Finally, AJ's complementary colors for Malum, who brought his RTR-reinforced, 5-tribesmen Weird deck to the field, and up to winning the Semi-Virgin Prize. And that's actually not weird at all, since most of the other players were using well-known, popular tribes (shame on them). And we have a new Wise King! Two weeks after ellmaris's feat with his 5-buck Vampire Top 4 build, the bar has been furtherly raised (or, well, lowered) by morpphling's Goblins to an unconceivable 2-bucks-and-a-few-pennies (and this time it's an undefeated deck!). This in a week where no Top 4 deck went over the $200 threshold, with another one, Jerkburton77's Ninja build, being a little over 10 bucks. Good job, everybody. Christmas break! In the meantime, you can check all the past installments here. Holiday break, as well! Our contributors will come back after they finished celebrating whatever they celebrate. So, the last event of the year on December 29 will be the long-awaited Commander Tribal. I agonized about the rules for a while now, with people from all sides (Commander experts, 100cs specialists, Tribal players) telling me to ban this and that. Then it just occurred to me: these 1v1 Commander Tribal games will just have to be Commander games, nothing more (in fact, the tables will have to be set as Commander structure, Commander format, 30-minute 2-out-of-3 match). If anything, they are Commander games with a built-in limitation: the need to include 33 tribal creatures in the main deck. And that's it: you manage to have 33 creatures of a single type in your main, Commander-legal deck, you'll be fine. No need to find much more complications about that. The regular Commander pool of cards (Sol Ring! Strip Mine! Survival of the Fittest!) is already defined by the client, and the official Commander banned and restricted list automatically applies (remember that Primeval Titan is banned now, while Kokusho, the Evening Star is allowed, but not as a Commander). Let's just add the Tribal banned list and our usual additional banned and restricted list (columns B to D of this page), mainly to limit the Trifecta of Doom as we use to do in normal Tribal games. Also, let's just ban the choices too easy, so we can see some variety: Elf, Goblin, Human, Wizard and Wall are not allowed as tribes. Single members can be included in the deck or as a Commander though. The Rules: we now have a page with all the rules listed, so we won't have to repeat all of them before any tournament. Yay for time saving! The Top 8 Lockout: since last week, every time a Top 8 player (either from this year's ranking or all-time) will end undefeated, they will not be allowed to register the same tribe and deck again for 4 events (i.e. they'll have to register a different deck or decks 4 times before coming back to the undefeated one). With "deck" is meant a specific, recognizable archetype (e.g. Wall-Drazi), which in some case will be linked to a specific combo card (e.g. Helm of Obedience). A list of the current lockouts is maintained here. The Watch List: some particular, archetype-defining cards have been put into a specific Watch List, giving them Annoyance Levels based on how freq: since last week, every time a Top 8 player (either from uently they show up and their degree of success. Once a card gets to Level 3 or more, it'll be banned until enough weeks will have passed to make its appearance ratio acceptable again. So far, with 12 cards on watch, none of them reaches an Annoyance Level. The Tribal Achievements: Clan Leys, which is in charge of any Special Prize, has launched and is handling the Tribal Achievements: a way to have fun within Tribal Apocalypse, challenge yourself to do all kinds of strange MTG feats, and make some tix in the process. You can find the complete list of achievements here on the Hall of Fame. 38 unlocked, 12 to go. Remember to call in me or vantar6697 as a witness (start with the one that's NOT playing in that moment) before moving on in case of an In-Game or Endgame achievement. That's not needed for Deckbuilding achievements, you just have to declare them. The Virgin Prize has ended! And the last tribe standing was... drum roll... Mongoose! Now, this lead to two things: 1. the award has been replaced with the Semi-Virgin Prize, for tribes that've been played no more than 3 times (current list is here); and 2. Mongooses becomes the protagonists of a new, dedicated prize that will remember forever that you all neglected them despite Nimble Mongoose being featured in high-profile, tier-1 Legacy decks. From now on, The Mongoose Pride Prize will award 1 tix (at SBena_Bot) to everyone who'll just... play Mongoose. That's right, you just have to play them and you'll get 1 tix, till the end of times. Well, there's just one clause: you have to win at least one match with them within the event. Let's show them all what the mighty Herpestidae can do, shall we? Topical Prize rotation! As we have returned to Ravnica, we said goodbye to Avacyn Restored's star tribes, Angel and Demon, and we embraced a whole new set of tribes for the Topical Prize. It's five tribes, each representing a different guild as portrayed in their relative keyrunes: Bird (for Azorius), Elemental (for Izzet), Devil (for Rakdos), Insect (for Golgari), and Wolf (for Selesnya). You don't necessarily have to play them in their guild's colors, but that gets bonus points for style and topicality. The Hamtastic Award: the Biodiversity Prize dedicated to the memory of Erik Friborg has started again, for its 3rd edition. Be the first to run 10 different tribes in a row and you'll get 5 tix on SBena_Bot! Current leader: mihahitlor with 9 tribes played, only 1 to go. Remember that you have to play all the rounds of an event in order for the tribe to be added to your sequence. If you repeat a previous tribe, your whole sequence resets. After this edition is over, the Award will reset to only 5 different tribes in a row, prize yet to be determined. The Volver Challenge is still unclaimed! I'll give 1 tix out of my pocket to the first player who'll win a proper match (no bye, no opponent forfaiting) with a Volver deck featuring 4 copies of each of them. Videos: Send me replays of your games, please! Don't know how? Read this quick guide in 6 easy steps and start saving your tribal feats for posterity! And Slugs for all! To honor the memory of BlippyTheSlug (the longest-run host of Tribal Apocalypse), any new player can ask me for a one-time free treat: a full playset of any and all Slugs ever printed and available online (that is (Splitting Slug), Molder Slug, Thermopod, and Catacomb Slug). Courtesy of MTGO Traders and Clan Leys/SBena_Bot. The gift is meant for players who never took part before on a TribAp event, but I can grant it to recent players or budget players too, at my discretion. So just ask me for that, maybe you'll be lucky. 2.51 (Week 103 BE), on December 22: Christmas Special. No blue or black color identity or mana symbols (including hybrid mana and Phyrexian mana), allowed on cards, including lands. Special prize for the deck with most Snow permanents. 2.52 (Week 104 BE), on December 29: Commander Tribal. Hey, I already talked about it! Addendum: Wall is NOT banned for the Tribal Commander. Why did I even consider banning them? It's not that you can do Wall-Drazi in Commander. :) Commander Tribal Wall might actually be a cute deck. Also: I'm developing a way to have "joined tribes" decks, to allow for smaller tribes to still be used (you need at the very least 17 members to reach 33 with 16 Changelings, but even in that case, you would need a 4-color Commander, and even if I'm going to give Karona or Child of Alara as catchall Commanders for lesser tribes, they're not thematically suitable for everything.) For instance, here's one: Politics & Thieves. Members: any Advisor or Rogue. Allowed Commanders: any Legendary Advisor. And another one on the same lines: Law & Order. Members: any Advisor or Soldier. Allowed Commanders: any Legendary Advisor. (Advisors are 22, but none of their legends would be able to command a full tribal deck, even using the available Changeling). You only mentioned the Trifecta of Doom, but if you use the usual tribal wars restricted list for this, then SFM is banned off-tribe, correct? Kinda stinks for the Voltron decks if so, but I guess it's only one card out of 99. Yeah, didn't want to do too many exceptions. Even other cards of our banned list aren't going to do much in a Commander environment, but we just take it as it is and roll with that. Hope building for this Commander experiment will get the tribal community to discover the format. Building for Commander is the ultimate MTG experience. You really use the WHOLE pool of cards (or 99% of it), and you keep finding powerful cards that all the other formats just forgot or dimissed. Here's an example: Do or Die. Who ever uses Do or Die? It's rarely seen in Commander even. But it's amazing, a big hit on the opponent board for 1B. Playing Commander you discover all kinds of stuff and realize that nobody (but possibly AJ) really knows all the many, many thousands of existing cards. 1v1 commander is a very different world than multiplayer, and having the decks so creature-heavy will be unique. I have a couple options partially brewed up from last time we were planning this, hopefully I can fit it in between my holiday travelling to play the event. Even if not, that will be the first event for which I do my new deck tech series, and since I actually do know a bit about 1v1 commander archetypes from research into the format I did, should have a decent grasp on it even though it's not really my "home turf". Most of the Commander regulars like to play off the wall good stuff to keep the format spicy. 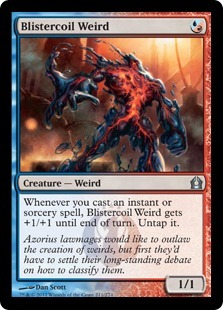 Though, like any format allowing so many cards which might be banned elsewhere, it can be really degenerate sometimes. AJ Really does have encyclopedic knowledge but there are many of us out there who have a similarly large breadth of understanding. I stopped being surprised by the knowledge of some vets years ago. Many don't play the apocalypse but then again you never know. I do agree that commander opens up possibilities if you aren't typically long on experimentation. BTW, Paul won my contest from two weeks ago, I have the prize (the set of Lightning Crafters) if you want to message me in MTGO to claim it. I added "Winter.Wolf" to buddies list. I would also expect some sort of shaman brew with tooth and nail/kiki-jiki kill options. If humans are an allowed tribe green/white would by something to look out for. Captain Sisay is well traveled ground for commander tournaments. Updates on this week's Tribal Commander! After some thought and talks with players, the event will be MULTIPLAYER, not 1v1. We'll do 2 rounds of Swiss (40-minute single games, 3-man or 4-man tables), then a Top 4 final table. Elf, Goblin, Human and Wizard are confirmed banned as tribes. Single members can be used as off-tribe cards or Commanders. Also: the only banned cards (in addition to the official Commander bannings that are built in the client) are Engineered Plague, Extinction and Tsabo's Decree. The other Tribal bannings/restrictions don't do much in Commander multiplayer (if you can't deal with Moat in Commander, you won't survive the game anyway), Emrakul is already officially banned, Iona can't hose a whole table, and Progenitus is hard to pull off. Plus, Elf and Goblin not being in the event as tribes makes cards like Glimpse of Nature and Goblin Lackey kinda irrelevant. Extinction itself is almost harmless in a format where Decree of Pain or Plague Wind are routinely casted, but I didn't want to push people into black-based builds over the allure of those 3 tribal-specific cards. Of the remaining two, Circle of Solace is easily dealt with, and Peer Pressure is just idiotic. Check the revised rules with the off-tribe Commanders and available tribe combinations here. I have to say, given a week's notice on the rules was really not enough to build something competitive. I built a dozen or so decks (different tribal variations) attempting to find something fun for myself and yet somewhat competitive and I don't think I succeeded. Half the decks I built don't stand up to the generic wilderness decks (I mean playing against random players/groups). The other half do but aren't really especially good at it. Group dynamics have a lot to do with whether a weak deck survives. That doesn't really make for a fun experience. Pity, given a few more weeks I might have a deck worth playing.